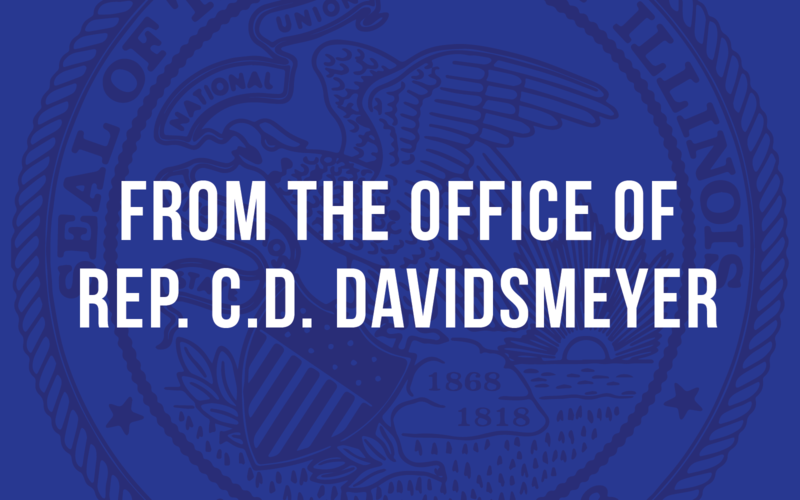 SPRINGFIELD, IL…State Representative CD Davidsmeyer (R-Jacksonville) released the following statement explaining his “No” vote on the motions to override the Governor’s budget package vetoes. “I voted for the budget packages earlier this week because I felt it was important to end the budget stalemate. Since that time, I have had many conversations with constituents and laid out the facts as well as the possible ramifications of not having a budget. I have heard their voice and agree that there is a need for spending reform in order to truly fix the State of Illinois. They understand that there are no easy answers, but at the end of the day, a budget deal has to do something meaningful, not just keep doors open. So today, I chose to do exactly what my constituents wanted me to do and voted ‘no’ on the motion to override. I hope that my ‘no’ votes jump start discussions on how we can grow our economy and put people back to work. For too long Illinois’ economy has lagged behind other Midwestern states. Citizens are leaving because there has been no action by the majority in the General Assembly to adjust their spending behavior. Debt from unpaid bills, interest and pensions are crushing us. To those waiting on payments, I will continue to work to get real reform that doesn’t put us in this situation ever again. We must do something that brings significant change to our state. We need regulatory relief, spending changes, and more opportunities for our people to thrive.